The DeSoto Cup is presented to the DXCC Challenge leader as of the 31st of December each year. The unique Challenge plaque is endorseable in increments of 500 and comes with the first endorsement "medallion." 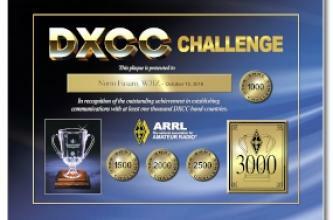 The DXCC Challenge Award is earned by working and confirming at least 1,000 DXCC band-points on any Amateur bands, 160 through 6 meters (except 60 meters). Certificates are not available for this award however, there is a distinctive wall plaque available to display your achievement. Plaques can also be endorsed in increments of 500 additional band points. Deleted entities do not count for this award. All contacts must be made after November 15, 1945. QSOs for the 160, 80, 40, 30, 20, 17, 15, 12, 10 and 6 meter bands qualify for this award. Bands with less than 100 contacts are acceptable for credit for this award and you do not have to have an active award on a band for it to qualify. The DeSoto Cup is presented to the DXCC Challenge leader as of the 31st of December each year. 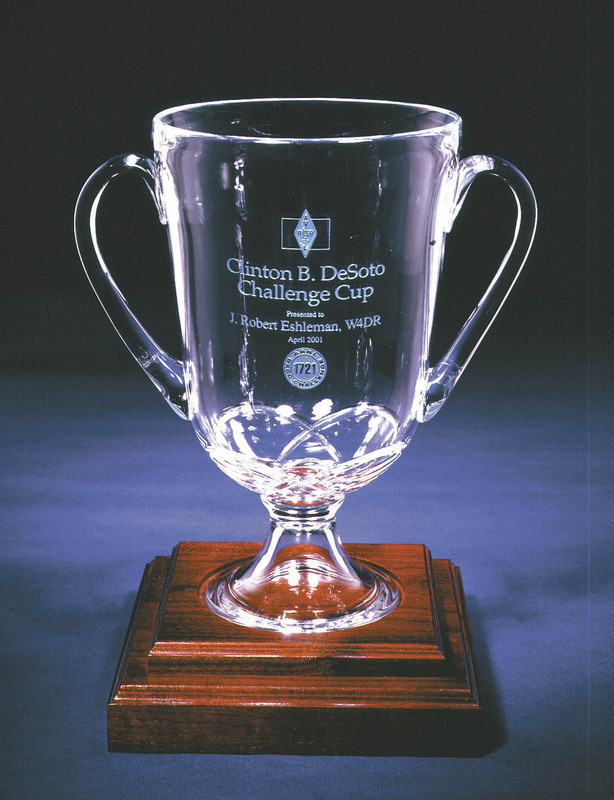 The DeSoto Cup is named for Clinton B. DeSoto, whose definitive article, "How to Count Countries Worked, A New DX Scoring System," in the October, 1935 QST, forms the basis of the DXCC award. Only one cup will be awarded to any single individual in their lifetime. A first place medal will be presented to a repeat winner in subsequent years. Medals will also be awarded to the second and third place winners each year. The unique Challenge plaque is endorsable in increments of 500 and comes with the first endorsement "medallion." A distinctive lapel pin indicating your Challenge level is also available. To order the wall plaque, pins and endorsement medallions, fill out the DXCC Challenge Order Form and order by email, fax, or postal mail, or telephone.